Pedestrian-only streets paved in white marble, lively bars built within ancient walls, boats cruising the glittering Adriatic, old men strumming mandolins to the tunes of classic folk songs, what’s not to love about Split?? The Roman Emperor Diocletian seemed to agree. After 21 years of ruling the world’s largest empire, he decided it was time to cash in his pension and enjoy his golden years. He chose Split as the location for his retirement home and spent 10 years building a massive palace right on the sea. After Diocletian’s death in 313 A.D., Roman Emperors continued to retreat to this heavily fortified paradise across the Adriatic. Not a bad vacation spot, eh? The only problem was that the Empire eventually fell, and the palace was abandoned. Having lived in Rome for a year, I’m used to being kept at a distance from monuments. These treasures of antiquity are usually preserved and protected behind glass panels, bars and railings. 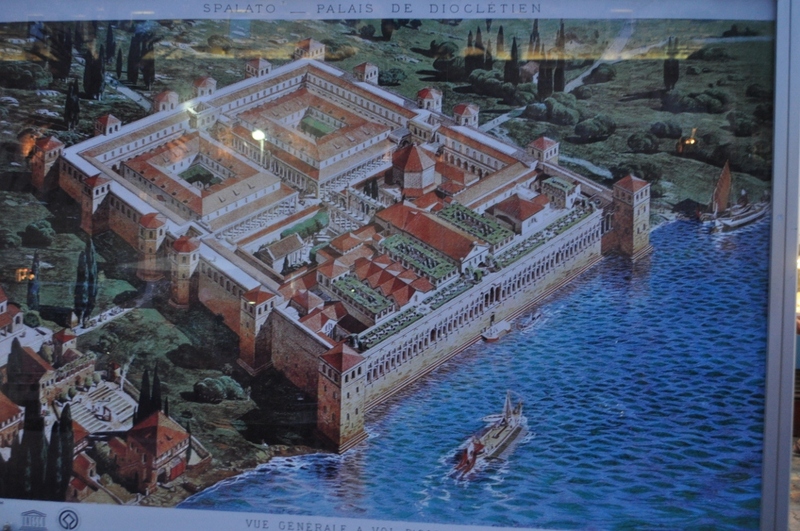 Not the case for Diocletian’s Palace. After the fall of the Empire, people from neighboring villages sought refuge in the palace and over the centuries, a city literally grew from within its walls. Markets, shops, art galleries, hostels, and restaurants flourish today within the architectural framework of the ancients. Favorite Split Moment: while strolling the narrow streets after dinner, we stumbled upon a central piazza filled with people; naturally we planted ourselves on a marble step and took in the scene. It was such a mixture of culture and generations: little British kids running in circles and playing tag while their parents plan the activities for tomorrow, local teenagers awkwardly trying to flirt, old men chatting over a drink, street performers dancing to live music…I could have stayed for hours. This entry was posted on December 15, 2012 by Katie. It was filed under The Balkans . Sally – the square at night is incredible! Definitely a reason to go back! !